The authors are not clear what they mean by lower, however its seems they mean lower today relative to the 1990s. At the risk of being pedantic, Gutiérrez & Philippon’s measures of market concentration for which both U.S. and EU data are reported cover the period from 1999 to 2012. Thus, “the 1990s” refers to 1999, and “today” refers to 2012, or six years ago. The table below is based on Figure 26 in Gutiérrez & Philippon. In 2012, there appears to be no significant difference in market concentration between the U.S. and the EU, using either the 8-firm concentration ratio or HHI. Based on this information, it cannot be concluded broadly that EU sectors have lower concentration than the U.S.
Gutiérrez & Philippon focus on the change in market concentration to draw their conclusions. However, the levels of market concentration measures are strikingly low. In all but one of the industries (telecommunications) in Figure 27 of their paper, the 8-firm concentration ratios for the U.S. and the EU are below 40 percent. Similarly, the HHI measures reported in the paper are at levels that most observers would presume to be competitive. In addition, in 7 of the 12 sectors surveyed, the U.S. 8-firm concentration ratio is lower than in the EU. The numbers in parentheses in the table above show the change in the measures of concentration since 1999. The changes suggests that U.S. markets have become more concentrated and EU markets have become less concentrated. But, how significant are the changes in concentration? 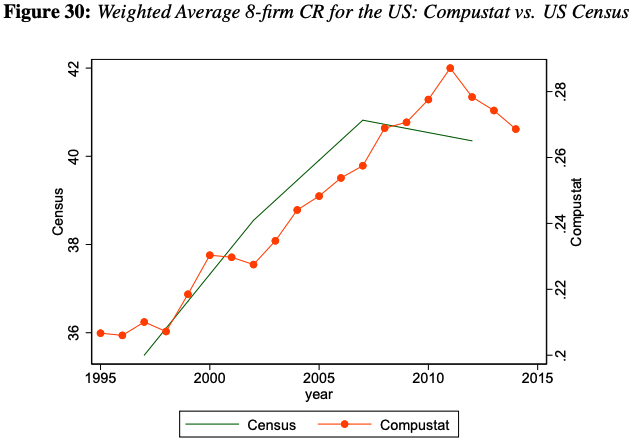 A simple regression of the relationship between CR8 and a time trend finds that in the EU, CR8 has decreased an average of 0.5 percentage point a year, while the U.S. CR8 increased by less than 0.4 percentage point a year from 1999 to 2012. Tucked in an appendix to Gutiérrez & Philippon, Figure 30 shows that CR8 in the U.S. had decreased by about 2.5 percentage points from 2012 to 2014. A closer examination of Gutiérrez & Philippon’s 8-firm concentration ratio for the EU shows that much of the decline in EU market concentration occurred over the 1999-2002 period. After that, the change in CR8 for the EU is not statistically significantly different from zero. A regression of the relationship between HHI and a time trend finds that in the EU, HHI has decreased an average of 12.5 points a year, while the U.S. HHI increased by less than 16.4 points a year from 1999 to 2012. As with CR8, a closer examination of Gutiérrez & Philippon’s HHI for the EU shows that much of the decline in EU market concentration occurred over the 1999-2002 period. After that, the change in HHI for the EU is not statistically significantly different from zero. Readers should be cautious in relying on Gutiérrez & Philippon’s data to conclude that the U.S. is “drifting” toward greater market concentration while the EU is “drifting” toward lower market concentration. Indeed, the limited data presented in the paper point toward a convergence in market concentration between the two regions.